Exclusive Dealers for Precision Sailboats, designed by Jim Taylor Specializing in “hands on” personalized attention throughout the entire sales process. We offer a full range of consulting services to our clients ranging from strategic planning to preparing a boat for sale, to full analysis and search for a suitable vessel for a buyer. We provide information and advice about the advantages of various design features and construction methods offered by different yacht builders. We help guide you through the survey and sea trial process. We help to arrange dockage, insurance, financing and virtually any other aspect of boat ownership required. Whether you are interested in Sailing Yachts or Motor Yachts, call us to learn how Windswept Yacht Sales will fulfill your boating dream in a pleasant, uncomplicated and hassle free way with a level of attention to detail that buyers and sellers will find refreshing. You can see details and photos of all our listings at www.windsweptyachtsales.com We get boats sold. Call for a no-cost market evaluation of your current boat. Visit our website for tips to sell your boat and to learn what our customers are saying about us. Rebuilding a Gemini 3400. Page 34. Photo by Gary Dickinson. Sailing Robots. Page 44. Photo by Aland University of Applied Sciences, UK COVER PHOTO: Windlassie, an Irwin 43, arriving in Clearwater, FL, from Panama City Beach in February on calm waters in the Gulf. Photo taken from buddy boat S/V Tropical Texan. Photo by Pam Alexander. • Owner-operated by boaters for boaters • 8’ deep channel off the Waterway in freshwater section (for engine flush) • 40 & 50-ton lifts — boats up to 16’ 6” beam • Crane Service • Auto/RV/Trailer Storage • Hot Showers! CONTRIBUTING PHOTOGRAPHERS/ART Aland University of Applied Sciences Pamela Alexander Rebecca Burg (& Artwork) Matthew Cohen Photography Gary Dickinson Tim Wilkes EDITORIAL CONTRIBUTIONS: ARTICLES & PHOTOGRAPHY: SOUTHWINDS encourages readers, writers, photographers, cartoonists, jokers, magicians, philosophers and whoever else is out there, including sailors, to send in their material. Just make it about the water world and generally about sailing and about sailing in the South, the Bahamas or the Caribbean, or general sailing interest, or sailboats, or sailing. Go to swindsmag.com for information. SUBSCRIBE Third-class subscriptions at $28/year. First class at $34/year. Call 941-795-8704 or mail a check to address above or go to our website. system in the boat; and because he had to replace many of the systems with brand new ones, his boat is better in many other ways, because if he had bought a 1994 Gemini in good condition, most of the systems in the boat, although still working, would be 24 years old. Last summer, I did a book review on Fiberglass Boat Restoration by Wayne Canning. Wayne discusses in his book pretty much what Gary did in purchasing his boat, which was closely analyzing the boat and its potential costs before purchasing. Gary’s project is one of the best success stories of boat rebuilding I have heard about. A friend of mine in Charleston bought a sailboat that was partially sunk and damaged after Hurricane Hugo came through Charleston in 1989. He got it at a great price and brought it back to life and ended up with a boat worth a lot more than the money he put into it. With the number of boats damaged in Florida and the Caribbean from Hurricane Irma, there are a lot of opportunities out there for boat rebuilding. My advice is to get Wayne’s book and read it carefully. Wayne did a seminar on buying and fixing up boats damaged from a hurricane at the St. Petersburg Boat Show in December. The advice he gave was pretty much what is in his book. And one thing he said in his seminar is that it takes several months before the boats damaged from Irma will hit the market, which means they are coming into the market about now. For those interested in buying and fixing up a damaged boat, you might want to think about advice I learned over many years in the construction business about fixing up an older home: You make your money on the purchase price. Probably holds for damaged boats too. To have your non-race event listed, contact editor@swindsmag.com. Email the information (not just a link) by the first of the month preceding publication. Contact us if a little later. They must be public events that are free, or nominal low cost. Other for-profit events can be listed for $35/month up to 150 words (text and title) for first month, $25 for second month. We will print your public event for two months (rendezvous for three months). (If your for-profit event has a quarter page ad or larger, a 150-word notice in this calendar is included for two months.) You can also list your event on our online calendar, swindsmag.com. Go to EVENTS. No charge for: (1) You have a print ad for the event in the magazine; (2) Public events, non-profit events, free events; (3) Club regattas, marine flea markets, boat shows and other similar events. Contact us for other for-profit events. US SAILING INSTRUCTOR AND COACH COURSES IN THE SOUTHEAST (NC, SC, GA, FL, AL, MS, LA, TX) Go to the website for courses that might have been scheduled after our press date. For more on course schedules, locations, contact information, course descriptions and prerequisites, go to www.ussailing.org/education/teach-sailing. No courses scheduled in the southeast U.S. as of press date. Check the website, since courses are often added late. For learning-to-sail and powerboat handling courses, go to www.ussailing.org/education. Small Boat Instructor Course Level 1 Lakewood Yacht Club, Seabrook, TX, March 3-4, March 10-11, two consecutive weekends. Contact Marie Wise at sailmom@gmail.com. Instructor Stephen Gay. Edison Sailing Center, Ft. Myers, FL, March 17-20. Contact Stephanie Webb at rpsc1983@aol.com. Instructor Margie Graham. Ft. Walton Yacht Club, Ft. Walton Beach, FL, March 22-25. Contact Linda Wright at fleetcaptain@fwyc.org. Instructor Joey Mello. Privateer Yacht Club, Hixson, TN, March 29-April 1. Contact Steve Sherman at steve@optistuff.com. Instructor Blair Overman. Lake Lanier Sailing Club, Flowery Branch, GA, March 31April 3. Contact Alex Padgett at llscwaterfrontdirector @gmail.com. Instructor Bruce Cattanach. Small Boat Instructor Course Level 2 Edison Sailing Center, Ft. Myers, FL, March 17-18. Contact Stephanie Webb at rpsc1983@aol.com. Instructor Richard White. Small Boat Level 3 Coach Clearwater Community Sailing Assoc., Clearwater, FL, March 24-25. Contact Stephanie Webb at rpsc1983@aol.com. Instructor Richard White. Basic Keelboat Instructor Evaluative Course Offshore Sailing School, Fort Myers, FL, April 5-7. Contact instructor Paul Chechak at paulchechak@gmail.com. US Sailing Offshore Safety at Sea Seminar; Course with Hands-on Training; Hands-on Training Only; and Sea Refresher Course (these are separate courses, contact for information) Lakewood Yacht Club, Seabrook, TX, April 14. Contact Foy Curley fcurley@lakewoodyachtclub.com. Trawler Fest, Stuart, FL, March 6-11 This event is sponsored by PassageMaker magazine and will be held at the Hutchinson Island Marina in Stuart, FL. The In-Water Boat Show is held March 8-11 and Seminars March 6-11. Attendees come by boat and stay at the marina, or by land, staying at one of the local hotels. Seminars are held on a wide range of topics, along with demonstrations, discussions, parties, and exhibits with industry representatives. www.passagemaker.com/events. Mooring Products & Systems Tested & Proven to meet the rigorous standards of the United States Navy Heavy Weather Mooring Codes. The Wharf Boat and Yacht Show, a powerboat show, is one of the largest in-water displays and exhibitors along the upper Gulf Coast. 4550 Main St. www.wharfboatshow.com. Power boats, as well as vendors selling gear. Marina Jackâ&#x20AC;&#x2122;s in downtown Sarasota. www.ShowManagement.com. Annual Southwest International In-Water Boat Show, Houston, TX, April 12-15 A large selection of sail and powerboats with a Discover Sailing program www.southwestinternationalboatshow.com. 9th Annual Oriental In-Water Boat Show & Nautical Flea Market, Oriental, NC, April 13-15 Oriental Harbour Marina docks. www.orientalboatshow.com. Charleston In-Water Boat Show, Charleston, SC, April 20-22 This show will be at Bristol Marina and Brittlebank Park, 185 Lockwood Blvd. www.charlestoninwaterboatshow.com. SEAFOOD FESTIVALS and NAUTICAL FLEA MARKETS 40th Annual Dania Marine Flea Market, Mardi Gras Casino, Hallandale Beach, FL, March 1-4 Private individuals and corporate vendors sell marine equipment, antiques, used boats, fishing tackle, diving gear, marine artwork and boating-related items. Worldâ&#x20AC;&#x2122;s largest marine flea market. Thursday-Saturday: 9am-6pm. Sunday 9am-4pm. Free Parking. www.daniamarinefleamarket.com. Island Nautical 24th Annual Nautical Flea Market, St. Petersburg, FL March 17 Spaces available for sellers. Shop for bargains, sell your old stuff or browse. JSI parking lot, 2233 3rd Ave S., St. Petersburg. 8 am to noon. Call to reserve space at 727-577-3220.
with new cooking units that plan to cook 6000 pounds of boiled crawfish per hour. Held under the Kemah Bridge at 300 3rd Street. www.gulfcoastfestivals.com. Waterway Zydeco & Crawfish Festival, Gulf Shores, AL, April 14 Fresh boiled crawfish and zydeco music by some of New Orleans best bands, along with arts and crafts display. East 24th Avenue in the Waterway Village of Gulf Shores. www.gulfcoastartsalliance.com. Pompano Beach oceanfront. Held on the beach at the Pompano Pier, featuring fresh local seafood prepared by area restaurants. www.pompanobeachseafoodfestival.com. The Morgan Invasion is now part of the Tampa Bay Hospice Cup. Held at the Davis Island Yacht Club. Go to the “Racing News” section (following this section) for more information. Educational seminars on navigation and information on the portion of the Loop between Norfolk and the Tennessee River (site of the fall rendezvous), presented by experienced cruisers. www.greatloop.org. Register early as this event is often sold out. Promote and List Your Boat Rendezvous SOUTHWINDS will list your Rendezvous for three months (other events are listed for only two months)—to give boaters lots of time to think about and plan their attending the event. This is for rendezvous held in the Southeast U.S. or Bahamas. Send information to editor@southwindsmagazine.com. Quiet diesels with clean emissions that meet current EPA requirements, without the need for computer-controlled common rail complexity. on-the-beach events to capture the interest of non-racing cruisers, as well as racers: Vvolleyball tournaments, softball, coconut harvest, bridge, Texas Hold’em poker, beach golf and much more. Opening night of the regatta is a very big event. For more information and exact dates, go to www.georgetowncruisingregatta.com (go to “Schedule” for 2018 schedule). USA Junior Olympic Sailing Festival, Sarasota, FL, April 7-8 Sarasota Sailing Squadron Youth Sailing Sailfest. Contact Alana O’Reilly at sarasotayouthsailing@gmail.com. 8th Annual West Marine Stand-up Paddle Board Carolina Cup, Wrightsville Beach, NC, April 18-22 The world’s largest gathering of stand-up paddleboard racers will be held at the Blockade Runner Beach Resort. Over 1000 competitors from the around the world. www.wrightsvillebeachpaddleclub.com/carolina-cup. 34th Annual Interstate Mullet Toss and Gulf Coast’s Greatest Beach Party, April 26-29 Individuals on the beach throwing a mullet from a circle in Alabama to the state line in Florida to benefit local charities. Largest Beach Party in the South. www.florabama.com. The Melges 20 Winter Series is three events held annually for the large fleet of Melges 20s that campaign in Southern states and the Caribbean each winter. All events are held at the Coconut Grove Sailing Club: Event 1 was held in December; Event 2 is the Miami Winter Regatta in February; and Event 3 is the Melges Rocks Regatta in March. After Event 3, Melges 20 racing moves to Charleston Race Week. NATIONAL, INTERNATIONAL AND OTHER REGATTAS IN THE SOUTHEAST LISTING YOUR RACE – SOUTHWINDS lists races with date, event and sponsoring organization in the eight southeastern states in the “Racing Calendar” section at the end of the magazine. Listed below are upcoming national, international and other major regattas. Cost to list a regatta with a description in this section is $35/month ($25 for second month) for the first 130 words (text and title) and $45/month ($35 for second month) for 200 words total. No listing over 200 words allowed. Regattas that run display ads (1/4 page or larger—we give regatta ads reduced rates) will get 150 words at no additional charge for two months. Email editor@swindsmag.com, or 941-795-8704, around the first of the month preceding publication to list your event or place an ad. Crown Cars Regatta, Gulf of Mexico, Tampa Bay, March 10 This event is now in its 34th year and continues to give participants a great time on the Gulf of Mexico. It is open to all classes with windward/leeward and random-leg courses for different classes. This regatta is a Suncoast Boat of the Year and Gulf Boat of the Year event. NOR and entry forms can be found on the St. Petersburg Yacht Club website at www.spyc.org. You can enter these three races for one combined, reduced rate: Pusser’s Rum Cup, Crown Cars, and Suncoast Race Week. See details on the website. Snipe Winter Circuit, Florida and the Bahamas, March An annual series of events each winter. Five regattas at three different locations in March. First is the Nassau Winter Series held at the Royal Nassau Sailing Club in the Bahamas, March 1-4. Next comes the 80th Midwinters at the Clearwater Yacht Club March 18-20. The final event is the 51st Don Q Rum Keg Regatta at the Coconut Grove Sailing Club in Miami, March 23-25. http://snipeusa.com/2017-snipe-winter-circuit/. under will compete in the inshore series held in the Matanzas River just north of the Vilano Bridge in St. Augustine. On Saturday and Sunday, April 7-8, the Junior Regatta, featuring Optis and 420s, takes place just north of the Castillo de San Marcos in full view of downtown spectators. The variety of race formats allows boats of all sizes to compete in this regatta. Paddle board and kayak racing takes place in Salt Run on Saturday and Sunday. Race Week parties, music concerts and awards presentations have been moved from the downtown location to the St. Augustine Yacht Club, due to construction activities planned for the Municipal Marina in spring. However, the public is invited to the activities at the club. Competitors wishing to register can do so at www.staugustineraceweek.com. Updates can also be found on the Race Week Facebook page at www.facebook.com/SARaceWeek. 37th Ted Irwin’s Memorial Pusser’s Rum Cup, St. Petersburg, FL, April 7 Hosted by the St. Petersburg Yacht Club, this is west Florida’s largest one-day sailboat race. All classes are invited and racing is in Tampa Bay. Courses will be around Government Marks. Pusser’s hats, great food and Pusser’s Rum parties. Notice of Race and Entry Forms can be found on the SPYC website at www.spyc.org. Hosted by the St. Petersburg Yacht Club in cooperation with the Davis Island Yacht Club and Bradenton Yacht Club. This event is a long-standing tradition among regattas on Tampa Bay, with three days of racing, beginning with registration and start on Friday at the Davis Island Yacht Club, racing to the St. Petersburg Yacht Club. On Saturday, boats race to the Bradenton Yacht Club. On the third day boats race around government marks in Tampa Bay near St. Petersburg. The awards will be at the Davis Island Yacht Club on April 20. This is a qualifier for both the Tampa Bay/Suncoast Boat of the Year, the St. Petersburg Ocean Racing Circuit and the Gulf Boat of the Year. Notice of Race and Entry Forms can be found on the SPYC website at www.spyc.org. The Tampa Bay Hospice Cup regatta (TBHC) is a major fund-raising event that benefits both LifePath Hospice in Hillsborough County and Suncoast Hospice in Pinellas County. It is hosted by the Davis Island Yacht Club and is a club Boat-of-the-Year race. There will be a pre-regatta benefit dinner and silent auction gala to be held at DIYC on Saturday, April 7. The sailing features racing for monohulls, multihulls (catamarans and trimarans) and a “just for fun” race class where the start is from the dock, in late morning and no rating required. www.tampabayhospicecup.com. Sperry Charleston Race Week, Charleston, SC, April 12-15 See page 40 for an article on this upcoming event. 50th Regata del Sol al Sol from St. Petersburg, FL, to Isla Mujeres, Mexico, April 27th, 2017 — Celebrating 50th Year Golden Anniversary Entrants are already signing up for this annual race, which is celebrating 50 years in 2018. Skippers who entered their vessel (and race) in the St. Petersburg-Habana Race and this regatta will receive another discount in their entry fee. For fee and general information, contact Chairperson Elizabeth (Beth) Pennington at Chairperson@regatadelsolalsol.org, or through the website at www.regatadelsolalsol.org, or go to www.spyc.org. There will be seminars and final registration on April 26, 2018. Many pre-race and after-race activities are set that all are invited to, including crew and any others interested in attending. Anyone interested in joining in the fun on the island, but not necessarily wanting to sail, can fly to Cancun. Then, it is a short taxi ride and ferry ride to Isla Mujeres. In order to keep track of the boats and others coming to the island, people can get their regatta hotel reservations and ground transportation through the website using the reservation information tabs on the right side of the home page. There is a secure website page for online entries, or mail the entry in (address available on the website). You can also check out the Facebook page. The main regatta site is at www.regatadelsolalsol.org. 2018 Women’s Challenge Regatta Returns, Gulfport, FL, April 28 The Women’s Challenge Regatta, formerly known as the Bikini Cup and sponsored for many years by the Windjammers of Clearwater, is back. The current sponsor, Boca Ciega Yacht Club, was forced to cancel the regatta in 2017 due to a conflict with a city event. It is a goal of the Rhumb Runners at BCYC to promote and support women’s sailing. This regatta has a rich history of doing exactly that. Women of the Gulf Coast, assemble your teams, find a fast PHRF-rated boat and start practicing for the 2018 WCR to be held on Saturday, April 28. Registration closes April 20. For Notice of Race and more information, go to www.sailbcyc.org/WomensChallenge Regattta. Or contact the organizational chair, Barb Meyer, at 727-430-7241, or sunnlover@aol.com. 65th Annual Mug Race, Jacksonville, FL, May 5 The Rudder Club of Jacksonville hosts this race, touted as the longest river sailboat race in America. The race along the beautiful St. Johns River has challenged thousands of sailors as they test their skills against the river’s currents, bends and changing winds. Boats compete for the coveted Mug or to win one of the 50 class trophies. All sailboats with masts less than 44 feet are eligible. This year, the starting line is moving about three miles North to just East of Crystal Cove Resort. This new venue provides launching, docking, parking, overnight accommodations, restaurant, bar and entertainment—all in one location. We will transport all catamarans by Cat trax from the resort to the Rudder Club. Thursday night, May 2, Green Cove Springs Marina will again host the Half-Way Party with plenty of food, music, and beer. Registration, skippers meeting, and festivities are at Crystal Cove Marina on Friday evening. Saturday Night will be the after race party at the Rudder Club, with their famous breakfast on Sunday. Go to www.Rudderclub.com for registration, NOR and updates. 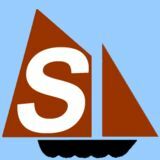 Contribute to Southwinds â&#x20AC;&#x201C; Articles and Photos Wanted Sailing Experiences: Stories and photos about experiences in places youâ&#x20AC;&#x2122;ve cruised; anchorages, marinas, or passages made throughout the Southern waters, the Bahamas and the Caribbean. Boat Reviews: Review your boat. See the ad on page 43 on reviewing your boat Charter Stories: Have an interesting Charter story? In our Southern waters, or perhaps in the Bahamas or the Caribbean? Write About Your Yacht Club or Sailing Association: Tell us about your club, its history, facilities, major events, etc. Youth Sailing: Write about a local youth sailing organization or sailing camp Bahamas and the Caribbean: Trips, experiences, passages, anchorages, provisioning and other stories of interest. Our Waterways: Information about the waters we sail in: disappearing marinas, boatyards and slips; mooring fields, anchoring rights, waterway access, etc. Maintenance and Technical Articles: Repairs, emergency repairs, modifications, additions, etc. Individuals in the Sailing Industry: Interesting stories about the world of sailors out there, young, old, and some that are no longer with us but have contributed to the sport or were just true lovers of sailing. Fun and Unusual Stories: Got an interesting story? Unusual, funny, tearjerkers, learning experiences, etc. Cover Photos: SOUTHWINDS is always looking for nice cover shots, which are always paid for. They need to be a high-resolution vertical shot, but we sometimes crop horizontal photos for vertical use. For more information, to discuss ideas, payment and requirements, contact editor@southwindsmagazine.com. Go to www.southwindsmagazine.com, and click on Writer/Photo Guidelines. NEWS FROM AROUND THE SOUTH AND THE WORLD OF SAILING Send us news, including business press releases, to editor@southwindsmagazine.com. We need to receive them by the 1st of the month preceding publication. Contact us if later (it most likely will get in, but not certain). Okeechobee Water Level Basically Same Level Since January As of press date in early February, Lake Okeechobee was at 15.21 feet above sea level. This makes the navigational depth for Route 1, which crosses the lake, 9.15 feet, and the navigational depth for Route 2, which goes around the southern coast of the lake, 7.35 feet. Bridge clearance at Myakka was at 49.26 feet. For those interested in seeing the daily height of the lake, navigation route depths and bridge clearance, go to http://w3.saj.usace.army.mil/h2o/currentLL.shtml (copy this address exactly as it is here with upper and lower cases). He set another record on his 28,000 nautical-mile trip when he sailed 851 nautical miles in a 24-hour period (averaging 35.46 nm/hour), breaking a previous record, that he held, of 784 miles. He made the journey on MACIF, his 30meter trimaran. The new record makes Gabart the fourth person to hold the round-the-world record. The others were Francis Joyon, Ellen MacArthur and Thomas Colville. Francois Gabart sailing on his record-setting trimaran, MACIF. Photo © Jean-Marie Liot / DPPI / Macif. After waiting a couple of weeks for a weather window, on Nov. 4, 2017 Frenchman François Gabart crossed the starting line off the Lizard Point lighthouse in Cornwall England to take on the challenge of the single-handed round-theworld record of 49 days, 3 hours, 4 minutes and 28 seconds, held by Thomas Coville since December 25, 2016. Gabart would need to cross the finishing line before Dec. 23 to set a new record. He crossed the finish line—the same line from which he started—a little more than six days faster, coming in on Dec. 17 and setting a new record of 42 days 16 hours 40 minutes and 35 seconds. Doug Fisher, President of Douglas A. Fisher, Inc. recently announced that his Sarasota, Florida-based sail loft will be changing its company name to Doug Fisher Sailmakers. The new company name reflects the full range of services he has been providing the sailing community for over 30 years. The company will continue to bring high performance sail designs to both the racing and cruising sailors paired with onboard services to enhance their sailing experience. As always, sails will be designed and constructed at the Sarasota loft. Fisher’s experience with big projects, such as the 4000-square-foot mainsail aboard the 170-foot schooner, Meteor and the complete refurbishment and new sails for the America’s Cup catamaran, Stars and Stripes, transfers to the projects the company brings every customer. Fisher’s extensive race records showcase the depth of his expertise with Stars and Stripes holding an 11-year record for the Ft. Lauderdale/Key West Race, broke the record in the Ontario 300 on David Fise’s F-27, 6 time Melges 24 class winner at St. Pete NOOD regatta, Winner of Melges 24 Midwinter Circuit, and over 20 class wins at Key West Race Week to name a few. Doug Fisher Sailmakers is located at 957 N. Lime Ave, Sarasota, FL. 941-951-0189. The Flying Scot is a daysailer racer of the highest quality. It’s supported by over 100 active fleets around the nation. The quality is backed up with an excellent new boat warranty, and excellent customer support from the factory. saltservice.net 2992 Overseas Highway, Marathon, FL 33050 Showroom MM 48.5 We Service and Sell Marine A/C, Refrigeration, Watermakers, Batteries, Solar Systems—Anything Electrical! Climb your mast alone with Mast Mate. SAILBOAT HAMMOCK Comfortable rope hammock uniquely designed to fit most sailboats. • PATENTED 3-POINT VERSATILE SYSTEM • WILL NOT TIP, SWING, OR FLIP OVER! Quality Craftsmanship Shorty Models start at $668 Standard Models as low as $589 Price includes S&H to all 50 states! Insect & Blackout Screens For Hatches, Portlights & Companionway Simple, innovative designs have universal fit and great pricing! Fast mounting using suction cups on underside of each hatch. Easy to set up, easy to store. Standard Hatch Screens - $36.95 Great Christmas Gifts! SAIL TIES SHEET / HALYARD BAGS SAIL BAGS We make bags from old sails too. Donate a sail and get a FREE bag. No more crazing & hazing! 336.403.1488 The Original Since 1986! The Ultimate in Portable Seating! Superior Comfort & Quality! A Cushion, A Seat, A Recliner… ALL IN ONE! Sunbrella™ marine canvas Made in the USA! FREE SHIPPING! WHITE WATER MARINE, INC • Bow Pulpits • Stern Rails • Ladders • Radar Arches • Pedestal Guards • Stanchions & Bases • Custom Stainless Parts • Stainless Grab Rails & More We have specs & fixtures in house for many older sailboat pulpits & stern rails. Give us a call! Buy the Sail, not the label! All You Need to Sail! Branding expert Ron Tite making the keynote presentation at the Forum. The wrap-up cocktail reception and Sunsail raffle on Saturday. Demo day on Friday. Boats were available on the beach for attendees to try out. Next year’s event will be in Jacksonville, FL, in early February, but it will be a symposium, which is more for instructors and directors, rather than a forum which attracted board members, yacht club officers and race committee officials. The 1994 completely rebuilt Gemini—after a year of rebuilding. The dinette before work began. be to repair or replace those items. Do you have the money to make the needed repairs and replace the damaged equipment on your boat? In addition to the cost involved, I had to take a good look at three aspects: Work I felt I could do myself; work I could do with friends; and what things were beyond my ability. With shop fees as high as $100 an hour you need to take that into account as you go through your list. Be realistic and take an inventory of your skills. Don’t get me wrong; during the restoration, I did many things that I had never done before. I found YouTube videos and other internet sites are a great resource, and I used them often. Years ago, I built a 26-foot center-cockpit sailboat from scratch, so I felt that I had the skills to tackle this restoration. Looking back, I think it might have been easier building a boat from scratch rather than trying to figure out how and why things were done as they were on my “new” boat. I bought my house as a fixer upper, so I have many of the tools I would need. I had to buy a few and was able to borrow others from friends. That cost was added to my list for the boat. Another consideration: Do you have the space and place to work on your project? I am lucky to have room at my house to do all the work except bottom painting, when I will have to have the boat hauled out at a yard. Yard fees can really add up, and if that is the case, it is one more expense that you will need to add to your growing list. Once you have taken inventory of all of the above and added your projected costs, you can make a realistic decision on whether you should take on a project like this, or save your pennies and buy a boat that is already finished. In my case it made sense, so I jumped in with both feet. Once my “dream” boat was tied safely to my seawall I gave her a good cleaning so the real work could begin. Where you start on your project depends on your priorities. For me, I wanted to make sure that the boat was watertight. Before I bought her, she had partially sunk, and I wanted to make sure that it never happens again. I found several places that allowed water to enter the boat, and it was an easy task fixing them one at a time. There is one spot where I was forced to do a temporary repair because she is in the water. I finished the repair when I had her pulled out to do the bottom job. I approached this restoration by addressing each system on the boat, one at a time. Because of the boat’s condition at time of my purchase, every system on my boat needed to be fixed or replaced. The research on how to fix things took a lot of time. I checked with suppliers, and on the internet, I read boating forums and blogs and watched how-to videos. For my particular boat there are online resources on how to fix things as well as listing links related to that task. Galley, starboard side, looking forward before work began. process of doing so, I opened a can of worms. Salt water had damaged all of the copper tubing for the propane. I replaced all of the copper gas lines with braided stainless lines. At the same time, I researched online for the original appliances my boat came with and if upgraded models were available. When I replaced the instant hot water, the stove/oven and the refrigerator freezer needed replacing. At that time I installed a gas control solenoid to the system—a big safety advancement. Rebuilding and Refinishing Other Areas In the previous article, I wrote that several of the floorboards were missing. I don’t know how that happened, but it was not much of a challenge making new ones out of marine-grade plywood. The first time I saw the boat, I noticed that one of the hatch covers was missing. I asked at the Counter, port side, looking forward before work began. yard where the boat was stored, and they said they had no idea what had happened to it. That brings me to the missing fiberglass hatch cover on one of the sponsons (hulls). I could not find a replacement cover that would match the three other hatches on my boat, so I decided to try and make one. I went outside my comfort zone when it came to making the 19x32-inch fiberglass hatch cover. Lucky for me, it is a mirror to the cover on the other sponson. I once more turned to YouTube and found out how to make a mold from my existing hatch. By following their directions and getting the supplies and support from Fiberglass Coatings of St. Petersburg, I was able to make an exact copy of the missing hatch, including the non-skid pattern—even the color of the gelcoat was matched. Replacing the lines for the running rigging on the boat was a straightforward task. I found the best price for line on EBay. After cutting the lines to length and whipping and fusing the ends, all I had to The counter after. do was sew the end of the new line to the old lines, making the task of running the new lines through the blocks at the top of the mast easy. I veneer is so thin that you will sand right through it. What sent the Genoa off to be cleaned and re-stitched if needed, worked best for me was Jasco premium paint and epoxy and it came back like new. One more thing off my list. remover. I brush the jell on, and in a few minutes, a wide As can be seen in the before photos, all of the teak inteputty knife will scrape away the previous finish. Then I rior needed refinishing. There are two sections that were lightly sanded the wood and gave it several coats of Star beyond refinishing, and they needed to be replaced. Rather Bright teak oil to protect the wood. than solid teak panels, my boat was made using teak After the initial cleaning and light sanding of the locker veneers. Lucky for me, I was able to find teak plywood and areas, I painted those sections with white Rust-Oleum satin a marine salvage yard in Tampa which matched what the finish enamel paint. The paint matches the look of the origmanufacturer used. As for refinishing the original teak, I inal finish in the lockers, is durable and cleans up well if you discovered right away that you can’t sand the teak. The get the area dirty. Stay a day…a month…a season…or a lifetime! Quantity and Quality Sperry Charleston Race Week is one of the sport’s singular events, a status that has been in the making for more than two decades. By Dan Dickison Thomas Sunderland’s winged Flash Mob is one of several boats whose owners seem content with the move to ORC scoring. Charleston Race Week/Tim Wilkes photo. Offshore entries will be treated to the new Open Course Format concept the organizers have devised. Charleston Race Week/Tim Wilkes photo. inaugural ORC sportboat class.“It’s definitely been a bucket list event for our entire crew. Now, we’re coming back so that we can defend our title, but beyond the racing, we also had a great time in Charleston. It’s a fun town by anyone’s standards. That, coupled with challenging sailing and a professionally run regatta mean that Race Week is still on our bucket list. The regatta is twice as large as any other event we’ll race in throughout the year. But it’s not just size that’s appealing, the before and after sailing events on shore are some of the best we’ve experienced.” And there you have it. Quantity and quality. Now that’s the basis for an enduring identity. Sperry Charleston Race Week runs April 12-15. For more information, log onto www.charlestonraceweek.com. JPROP… the feathering propeller that is easy to install and adjust. Fits all shafts and Saildrives Available in 2, 3 and 4 blade versions. an influence than I ever imagined. And that influence was not all good. Tahiti is typical of the rest of Horwitz travels, which—to name just a few—go to such places as Bora-Bora, New Zealand (where both Cook and Horwitz spent much of their time), more time in Australia (including Cook’s wrecking on the Great Barrier Reef), Niue (an island country in the South Pacific), Tonga, Alaska (Cook spent considerable time in Alaska) and Hawaii. Horwitz even goes to North Yorkshire in England, Cook’s homeport, to learn what he could about the explorer’s home. Horwitz ends his journey where Cook ended his, in Hawaii. Many people think of Hawaii when they think of Cook, since he was the first European there—“discovering” it, as some say. Plus Cook was killed there, an event that Horwitz spends a lot of time covering, in detail. It’s still a mystery. Reading this book you learn not only a lot about Cook, but about how he looked at the places he explored and how those whose lands he went to, looked at him—both then and today. The reader learns a lot about history and the current state of these places today. Some of the current residents—descendants of those who Cook met—believe he brought nothing but problems. Some have adapted, some continue to fight the changes Cook instigated, some are still trying to figure out what happened. This book was a great read, and as I said in the beginning, a nice surprise, as I didn’t know what to expect. I never read a book like this. Makes me want to read another of Horwitz’ books. His style is unique—and educational, with a smattering of fun. SOUTHERN REGIONAL RACE CALENDAR For Racing News, Race Training, and National, International and Major Upcoming Regattas in the South, see “Racing News” section. LISTING YOUR RACE – SOUTHWINDS lists races with date, event and sponsoring organization in the eight southeastern states. To list your regatta with a description in the Racing News & Regattas section in the front of the magazine, go to that section for information on how to list it, including placing an ad for the regatta at reduced rates. The below listings are free. Just email editor@southwindsmagazine.com with date, race/regatta name and sponsoring club. No other information needed (or wanted). LIST YOUR REGATTA ON OUR WEBSITE With our new website you can list your regatta (with more information) yourself on our online calendar for free. Go to swindsmag.com, and click on EVENTS. Club Races Not Listed Local weekly and monthly club races not listed. Contact the clubs. Generally, any sailboat is invited to club racing. Yacht Clubs Listed Below/Yacht Club Directory Clubs listed below are the clubs that have regattas listed this month or next month. 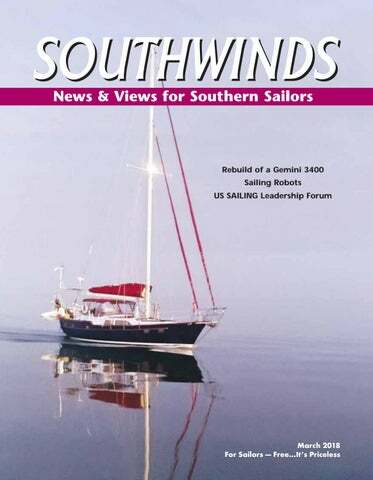 For a complete list of clubs in the Southeast, go to www.Southwinds Magazine.com and go to the club directory. To add your club or edit the listing, create an account on the online directory. You can then add additional information about your club: Location, regattas, club racing, cruising, activities, general information, etc. Note: In the below calendars: YC = Yacht Club; SC = Sailing Club; SA = Sailing Association. mat)—if the pixels are there. For pixels, we need at least 1700 pixels wide and 2200 pixels tall, so set your camera to the highest level of quality/resolution (most modern smartphones have enough pixels). We pay $65 for a cover photo. Email (or for questions) to editor@swindsmag.com. Please do not mail in printed copies of photos taken with digital cameras. We want the digital photo. Race Calendar Key West Community Sailing Center. A social hour featuring lite fare is held on Fridays from 6-8pm. Beginners and non-members welcome. The KWCSC is located at 705 Palm Avenue (off Sailboat Lane). 305-292-5993. www.keywestsailingcenter.org. Upper Keys Sailing Club (UKSC), Key Largo. www.upperkeyssailingclub.com. Go to the Club website for regular club racing open to all. MARCH 2-4 Moths US Nationals 3-4 Blackwater Sound Regatta 17 Commodore’s Regatta. Can You Help? Whether you want to adopt a new boat or find a good home for your current one, we can help you. S&J Yachts Sells & Lists Quality Boats Worldwide Providing You Personalized, Professional Service! 5 Locations Strategically Located from the Chesapeake Bay to Florida. For over 14 years we have acted as our clients trusted advisor throughout the entire process in the quest to sell or buy the yacht of your dreams! Representing both buyers and sellers, our goal is always to make your experience as easy and enjoyable as possible! YACHT BROKERAGE ADS : 30-word ad with horizontal photo: • $20/mo. for a new ad • $15/mo. to rerun an existing ad (no charge for small changes). Ads must be paid by credit card (call in). Email your ad in. PUTTING YOUR AD ON OUR WEBSITE Your Ad will not go online automatically. To have us place your print ad on our website immediately, add $15 to above prices for 3-plus months. You can place a print ad online: go to www.swindsmag.com. Free for gear under $200. DEADLINES : Dates change monthly, but 1st of month always works. Go to our website for dates. 30’ Cape Dory Cutter 1982. Owners third Cape Dory. Yacht club condition. Opposing Settees. Bulkhead table., all original! 20hp Volvo. 4’ 2” draft. $20,000. Stewart Marine, Miami. Marinesource.com. 305-815-2607. 1988 Mainship 36 Nantucket Fast Trawler. Twin, 160hp D3 Volvos, Two Staterooms and two heads. Recent awl grip and bottom paint. New galley appliances, windlass, electrical and plumbing. Spacious Fly Bridge for Helmsman with Bimini Canvas. 5.5KW Panda GenSet. Great “Looper Boat” Cruise, Liveaboard, or just look good at the dock. Asking $64,990. George Carter (941) 7929100. If your giving up sailing you don’t have to stop boating. 47’ Dufour Nautitech Catamaran 1995. With lots of new updated equipment, including new Twin 55hp Volvo Diesels, Refrig and Freezer, Generator, Chartplotter, Washer/Dryer, Watermaker, Windlass, 4 State Rooms w/en-suite head and showers. Spacious Catamaran capable of extended passages. www.GrandSlam YachtSales.com. Offered at $279,000. Call George Carter 941-792-9100. Yacht Sales. Curtis Stokes & Assoc., Inc. has opportunities throughout Florida for experienced brokers or new salespeople. Applicant must be ethical, hard-working and have a boating background. Training available. Inquiries confidential. 954-684-0218, info@curtisstokes.net. ________________________________________ Sailboat CAPTAINS needed in Miami. P/T day charter operation in Miami, FL. Must have a USCG 50Gt MASTER license or better. Sailboat experience required. Part-time only. More online at (4/18) www.MiamiSailing.net/careers. _________________________________________ Yacht Sales Person Needed Preferred Yachts, located at the beautiful Harborage Marina in St Petersburg, has an opportunity for an experienced full time yacht broker or we will train you. We are a unique boutique yacht brokerage with a large brokerage display center that attracts buyers and sellers from around the world. Preferred Yachts is one of only 50 Certified Professional Yacht Brokerages in the US and hold to the highest standards of professionalism, knowledge and integrity. With 38 years experience, we know how to help you be successful and our clients to achieve their dreams. For more details, Contact Joe Zammataro, CPYB Call: 727-527-2800 or Write Joe@PreferredYachts.com _______________________________________ Brokers Needed – S&J Yachts with offices from the mid-Atlantic to Florida is seeking experienced full-time sail & power boat brokers in FL, GA, SC, NC, VA and MD. Boating experience and team player a must! Friendly, professional working environment. S&J Yachts sells new and brokerage quality boats. www.sjyachts.com. Enquiries confidential. Contact Matt Malatich 843-872-8080 info@sjyachts.com _________________________________________ Edwards Yacht Sales is expanding! Several openings for yacht brokers in Florida. Looking for experienced broker or will train the right individual. Must have boating background and be a salesman. Aggressive advertising program. Come join the EYS team! Call in confidence, 727-449-8222 www.EdwardsYacht Sales.com Yachts@ EdwardsYachtSales.com _________________________________________ Doyle Sails Gulf Coast, St. Petersburg, FL. Seeking Outside salespeople to sell sails in the Gulf Coast region. Take your sailing hobby, make extra cash, or turn it into a career. Doyle Gulf Coast is the second largest Doyle production sail loft in the U.S. We are seeking outside salespeople to sell sails in our region which includes the entire Southeast. The position involves being able to measure a boat, price sails (we will assist with quoting), install, and follow up with customer. Please contact robert @ islandnautical.com, or call 727-800-3115. 30' Catalina 1992 MK III Wing Keel. Excellent condition. Cruise-equipped and ready. 25 HP Diesel. Walk-thru transom. Pod-mounted instruments. Heat/AC. Full Bimini, dodger, Cockpit, cabin cushions. New bottom paint and professionally detailed. Sacrifice for health. Fort Myers Beach, FL. Many extras. Best in class. Price negotiable. tedleman@gmail.com, or 239-850-2038. WATER PUMP from page 62 FedEx lady arrived, delivered the new pump and presented the invoice. I, in turn, coughed up the $50.28 and headed to the boat with the brand-new $$$ Surflo water service pump. Now to install it. Of course the installation area was a very tight space. Would the new pump fit and would it fit the old foot print? It looked as though it might fit the old footprint, but would definitely need a right angle thumbscrew fitting to attach the input hose to the pump. Well, it’s now 4:30pm. Will Standard Hardware be open and will they even have a marine, right angle, water pump fitting? What do you think? Camilla Googled Standard Hardware and they had closed at 4pm. A very good friend and professional boat captain stopped by to see how the project was going. He said that he thought he had the exact fitting that I needed and wanted to know how much money I had, kidding of course. He brought the fitting to the boat and it was correct, thread size and all. By now I chose to not tempt fate and wait one more night and start fresh in the morning to make the installation. That poor old worn out water pump had to suffer through one more night and morning of use before it could officially retire. After taking the dog for a short walk this morning, I climbed down into the engine room to make the new installation. The right angle wing nut fitting was snug, but perfect, and the rest of the installation went smoothly. At last, I climbed out of the engine room and approached the water pump circuit breaker for the initial test. I flipped the switch and the pump purred quietly, pumped out a strong flow of water and shut off on its own when the faucet was turned off. One last test; I climbed back down into the engine room with a bright flashlight and very happily found no leaks. I am going to bronze the old pump that would not die. Capt. David P. Hope sails on S/V Southern Heat. He is the author of Summer Heat, available at Amazon.com and BarnesandNoble.com. Read David’s article “Dog Onboard? Know What You are Getting Into” in the January 2016 issue in Back Issue’s at www.SouthWindsMagazine.com. ADVERTISERS INDEX TELL THEM YOU SAW IT IN SOUTHWINDS! SOUTHWINDS provides these lists as a courtesy and asks our readers to support our advertisers. The lists includes all display advertising.